I'm glad to report that the feeders have been filled. With a GOOD kind of birdseed, as requested. All seem pleased. These uptown birds. Don't they know I'm a downtown girl. Living in my backyard world. I always liked that song. I so now can relate to Billy. I saw him in concert once. In Iowa City, Iowa. College days. Fun times! Never saw the day comin' that I would be feeding and blogging about birds! 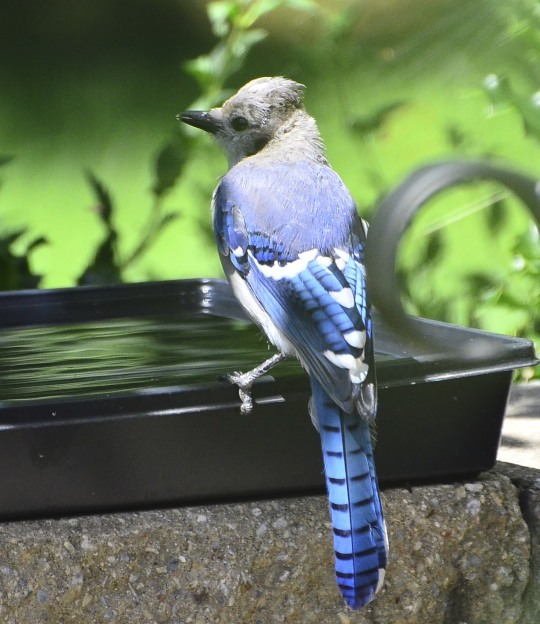 I have been enjoying the Blue Jay family that has been hanging around. I think there's a mom, pop and one teenager. They are rather loud and boisterous, which usually frightens the other birds away. I find them quite striking and fun to watch. They add so much color in the backyard. And by late summer, my yard could use some color. The other day, the teenager seemed distressed and was calling out over and over again while resting on top of my feeders. He must have stayed there a good five minutes calling and looking about. I assumed he was looking for his parents. But no one showed up. Eventually, he stopped calling and just sat there quietly. Rather unusual since they never seem to just sit around. Yesterday, after all that rain, the sun came out. My bird baths were quite full. As you can see, my baths aren't the standard bird baths. The one above is just a large plastic planter container which I so creatively turned into a bird bath. 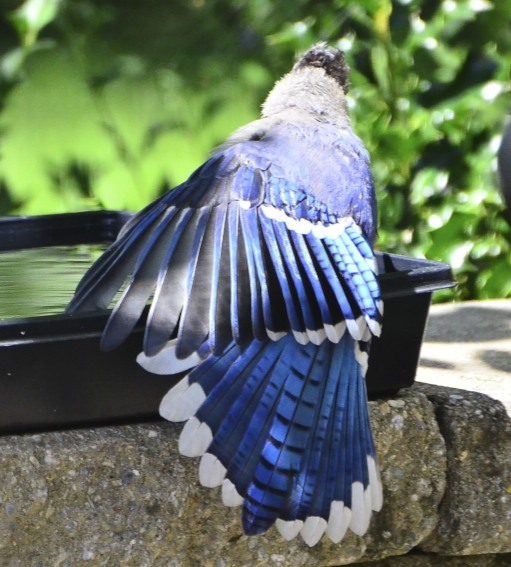 Some of you have really beautiful bird baths, so don't tell them that I'm cheap on that count too. The seed is expensive enough! The teenager stopped in and rested on my fake bird bath. Maybe more accurately, leaned over on it like a midnight drunk. And there he sat, spreading his wings out in such glorious blueness! I think he was hot. He was panting and seemed to be cooling down. But it wasn't even that hot of a day after the rain. Maybe in the mid 80's. It all seemed strange and I thought perhaps he may be sick. He was there like that for a long time. And then something startled him. He gathered himself up and flew off! Just like that! He was perfectly fine. Today, he and his parents were around enjoying that GOOD expensive bird food. It included some peanuts. That seems to be a big favorite of theirs. They'd fly in, grab a peanut and off they'd go and eat it in a nearby tree. It must have been exhausting. I caught the teenager napping in the afternoon. I don't blame him. That's exactly what I want to do after an expensive meal. Of birdseed! Wow, how did you get so close without them flying off. Awesome shots!! 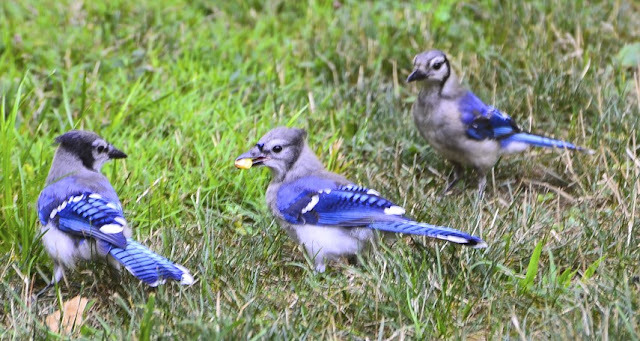 The jays around here won't sit still for a minute. Maybe I need to feed them better! 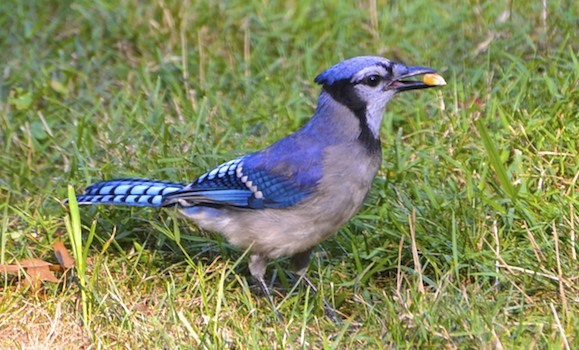 Blue jays really can go through a ton of seed in no time! I have to admit that we pull our sunflower seed feeder in for the summer months. We feed blue jays whatever they need in winter but in summer the jays can fend for themselves. They are handsome birds, though! And your photos are great. Blue jays LOVE peanuts. 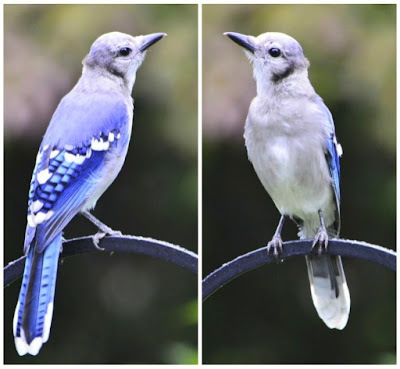 When I was a kid, whenever we'd even *think* of putting peanuts out, at least one blue jay would instantly appear. I don't know how they do it -- Peanut Radar, maybe. I think maybe the teenager got ahold of some pot seeds by mistake. Probably offered to him by some nefarious crow. Your springing for the good seed, I think they can deal with the bird bath. :-) We don't have many birds around with the dogs and all, but we do have a beautiful pair of cardinals and last year we had a humming bird. Unfortunately I don't have the best camera so I don't get the pictures. I was totally expecting a rendition of Uptown Girl...call it Uptown Bird. LOL that makes me laugh! I just love seeing your bird shots..
And the story that went with it.. They must love you for taking care of them.. I just bought a bird feeder.. I am hoping to get something besides pigeons at the feeder.. We will see.. They are beautiful bullies, aren't they? 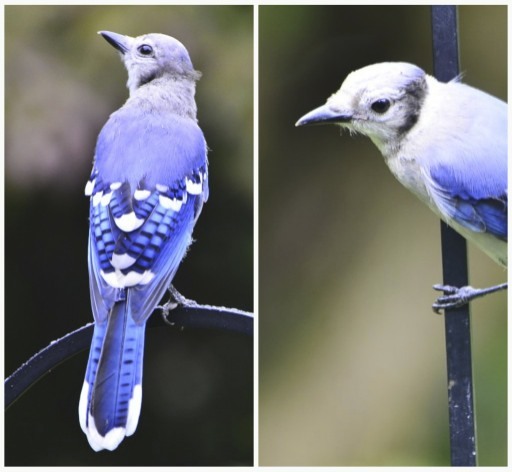 Your pictures of the bluejay family are wonderful and really show off their color! I am noticing things about them that I never saw before! We have quite a few around here, and I have never yet gotten a good picture. The colours of their feathers is amazing, so pretty. The young 'un sure has pretty feathers. I haven't been seeing many bluejays around lately, but in the spring there were lots of them. I like your unique style in bird baths. Your talent for bird photos is astonishing. These are fabulous as usual. We don't have any bluejays around our house and I miss them - I have a collection of their feathers somewhere. Gorgeous! And the young ones crack me up. Beautiful shots! LOVE the bluejays!! They are soo beautiful!! Your photos looks like you are right with them. You must have a fairly long lens. I like those shots with the feathers all fanned out. That's unusual. I love the loud-mouthed jays. They are very entertaining with their bossy ways. Thanks for the close up shots. They are beautiful. Peanuts??!! That explains why mine were all talking about packing up and heading to the big city. I see turkey vultures exhibiting the wing behavior as I drive to work in the morning. I always thought it was to warm up. Hmmm. I love your Bluejays there. Beautiful colour. A wonderful post and some very beautiful images. Well done. 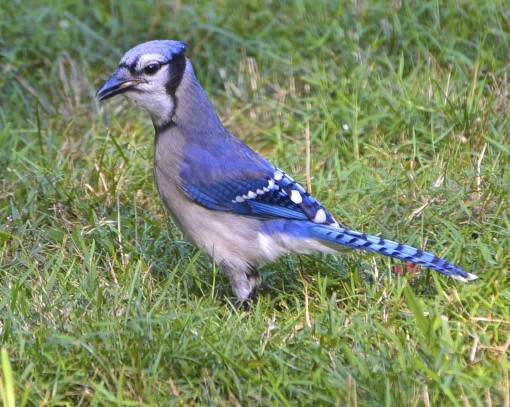 I like Blue Jays. But then, I like all of the brash, cocky ones, like the English Sparrows and Grackles. Your family is very beautiful. Do they ever come flying in to the feeders crying their alarm call? That's a favorite trick of the Blue Jays around here. Then, when they have the feeder all to themselves, they have a great feast. I think Junior exhausted himself crying for his mama ... but your capture of his cool off is superb ... and your three Jays would have been perfect for my three on thursday .. see, you see 3s too! your stories and photos are the best. I'm happy I stopped by here first thing this morning, it sends me off on my day with a skip in my step and a song in my heart. thanks Reena. happy Friday to you. I love the detail in the feathers, especially the center feather in the tail. It's the only one without a white tip. Just beautiful! Thanks for taking such wonderful photos. Hi Reena...oh I'm late to the party again. I see you posted last night. What fabulous pictures of the Blue Jays. I don't think I've ever seen their wings spread like this. Excellent photos. It is a funny coincident - my cousin's family saved a Magpie, obviously in the same age group as your teenager and he lived with them for several months under the name Teenager. After turning the house into a smelly bird toilet they had to let go and now he is playing the role of the Prodigal Son, visiting them whenever it's raining or when he is hungry. Talk about intelligence! i'm afraid being unemployed has cut back on my own ability to "dine out", so our birds will just have to fend for themselves. even though you are getting some lovely photos out of your expense! maybe i'll put out a sign directing them to your house. I always loved that Billy Joel song too . . . thanks for the memories. 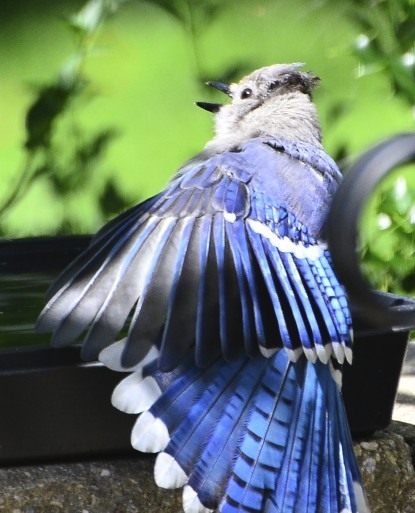 Blue Jays are beautiful, but definitely boistrous. You got some amazing shots, especially with their wings spread. My cheap plastic birth bath arrived today . . . not sure how it will fair but I'll give it a go. I really love the beauty of the Blue Jay. Thanks Reena. Beautiful photos - love the blue. 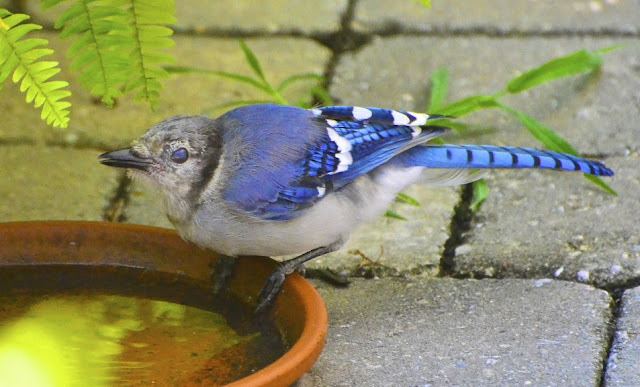 And I've never really seen a teen blue jay. Probably just haven't been paying attention. I'll be looking for them now! The blue is so striking! What hubris! Seems to me they ought to be grateful, right? One downtown chick to another. LOL! He was just gorgeous speading himself there. Come mating season he sure gone strut his stuff. Some girly bird is going to be lucky. LOL! Have a marvelous weekend renna. Cheers!! 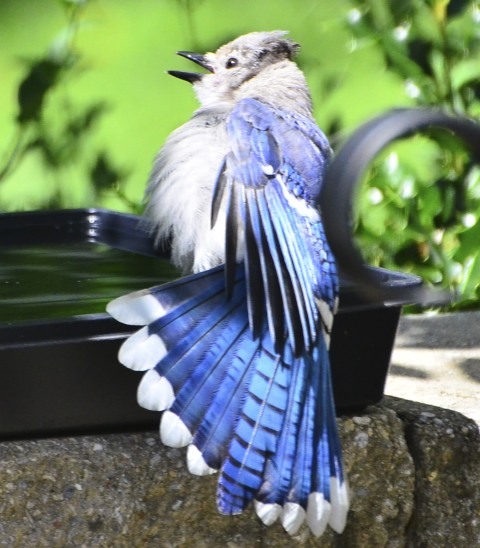 what wonderful pictures of your blue jay's....they can be quite bosterous and fun to watch. Wow, they are so beautiful!! Nice to have them in the garden. Great shots of the Bluejays. Goodness these birds are beautiful! Such color! Wow! How lucky you've got juveniles hanging (literally) around your place. Great captures and such fun to browse. You do get the most amazing photos. Of course they would not be nearly as much fun without the stories.